Facebook Average cpm cost per Thousand, SiteAdWiki - Research show's that Facebook Ad-Serving average cost per thousand performance increase standard rate 41% Facebook Average Cost per Thousand, Facebook Evolves Ad Offerings, CPC And CPM Drop. 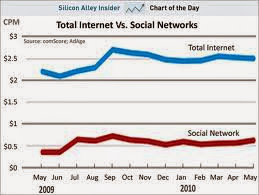 Facebook continues to expand and adapt its advertising offerings, metrics including CPM, CTR and CPC showed inconsistencies in Q1 2013 which are expected to level out as advertising normalizes on the social networking site. Facebook network strategic PMD Spruce Media highlighted these changes in its "State of Facebook Advertising Q1 2013," released this week, leading up to Facebook's Q1 earnings call set for May 1. 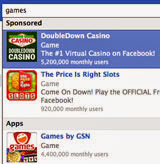 CPMs for all Facebook advertisements rose slightly by 3%, from $0.38 in Q4 2012 to $0.39 in Q1 2013. CPMs for desktop ads, or those ads on the right-hand side of the Facebook page, decreased by 24%; CPMs of desktop-only News Feed ads dropped by 18%, and those for mobile-only News Feed ads dropped by 31%. Facebook ads declined mostly, with the Q4 2012 CPC for all Facebook ads at $0.55, dropping 31% to $0.38 in the first quarter 2013. Desktop-only News Feed ads dropped from $0.43 to $0.41, while mobile dropped to $0.19, down from $0.30 in Q4 2012. CPCs for general desktop ads rose to $0.87 from $0.75. Since going live, the sponsored results ads have delivered. Nanigans customers 23x higher click rates while costing 78% less than the average cost-per-click commanded by Marketplace Ads. In some cases, sponsored results CTRs have exceeded 3%.